F.O.R. 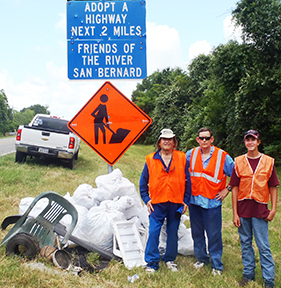 's second trash pick-up of the year, along FM 2611, a mile either side of the Churchill Bridge was on June 16, 2012. After three hours of cleaning the roadside on a hot, sunny day, 15 bags of trash and some larger loose items were piled beneath the F.O.R. Adopt A Highway sign for pick up by TxDOT. Volunteers who worked picking up trash were Tom Ronayne, high school student Clayton Nagler, Barbara Fratila, Vicki and Wayne Head and Nick Fratila, the Adopt A Highway chairman. Missing this time was mascot labrador, Hershey, who helps by sniffing out the trash. It was too hot for him to be there since he always wears his fur coat. If you missed it the first time, here's Tom Roynaye's profile of someone who messes with Texas.